Manipur civil voluntary organizations have reiterated their demand for immediate clarification from Prime Minister Narendra Modi and Union Minister of State for Home Affairs, Kiren Rijiju on the statement of interlocutor, R N Ravi in connection with the Naga agreement in a section of national media. They also asked State Chief Minister N Biren Singh to clear the state government’s stand on the issue. 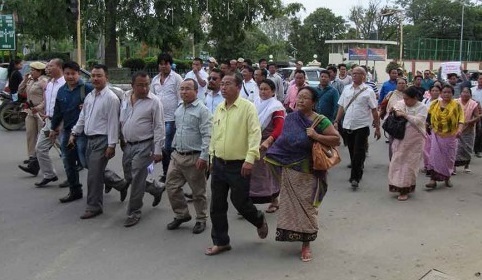 The United Committee Manipur (UCM), Committee of Civil Societies of Kangleipak (CCSK) and All Manipur United Clubs Organization (AMUCO) staged a protest rally from Keishampat Lemajam Leikai and marched towards the Chief Minister’s bungalow after staging a sit-in demonstration. However, the rally was stopped by the police at Nupi Lal Memorial complex and later allowed only 11 representatives of the organizations led by UCM president, Sunil Karam to submit a memorandum to the Chief Minister addressed to the Prime Minister. The 10-point memorandum urged the Prime Minister to immediately restrain R N Ravi from issuing any such provocative statements in media. Notably, R N Ravi stated of providing an autonomous Naga territorial council in the Indian Express on April 26 last that would have an adverse effect on the territorial integrity of Manipur. The protesting organizations also said that they have sought a clarification on May 6 last, but the Central Government has been maintaining a stoic silence on the matter. Asserting that the State will never compromise if the accord gives any adverse effect in the interest of the State, the organizations asked all the political parties and communities of the State to stand together in safeguarding the interest of the State.